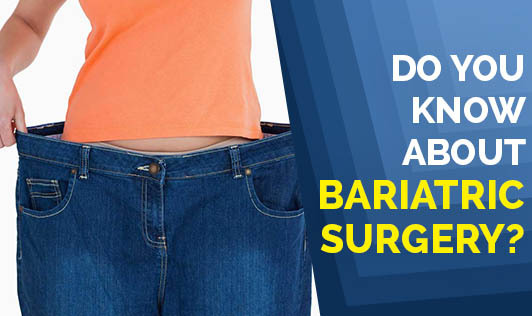 Do You Know About Bariatric Surgery? Bariatric surgery or weight loss surgery is the surgery performed on those who are morbidly obese. Weight loss is achieved by reducing the size of the stomach with an implanted medical device (gastric banding) or through removal of a portion of the stomach (sleeve gastrectomy or biliopancreatic diversion with duodenal switch) or by resecting and re-routing the small intestines to a small stomach pouch (gastric bypass surgery). Long-term studies show the procedures cause significant long-term loss of weight, recovery from diabetes, improvement in cardiovascular risk factors. The U.S. National Institutes of Health recommends bariatric surgery for obese people with a body mass index (BMI) of at least 40, and for people with BMI 35 with serious coexisting medical conditions like diabetes. Biliopancreatic diversion: Part of the stomach is resected, creating a smaller stomach (however the patient can eat a free diet as there is no restrictive component). The distal part of the small intestine is then connected to the pouch, bypassing the duodenum and jejunum. Adjustable gastric band: The restriction of the stomach can also be created using a silicone band, which can be adjusted by addition or removal of saline through a port placed just under the skin. This operation can be performed laparoscopically, and is commonly referred to as a "lap band." Weight loss is predominantly due to the restriction of nutrient intake that is created by the small gastric pouch and the narrow outlet. It is considered one of the safest procedures performed today with a mortality rate of 0.05%. Sleeve gastrectomy: Sleeve gastrectomy, or gastric sleeve, is a surgical weight-loss procedure in which the stomach is reduced to about 15% of its original size, by surgical removal of a large portion of the stomach, following the major curve. The open edges are then attached together (typically with surgical staples, sutures, or both) to leave the stomach shaped more like a tube, or a sleeve, like a banana shape. The procedure permanently reduces the size of the stomach. The procedure is performed laparoscopically and is not reversible. Gastric bypass surgery: Gastric bypass surgery makes the stomach smaller and allows food to bypass part of the small intestine. You will feel full more quickly than when your stomach was its original size, which reduces the amount of food you eat and thus the calories consumed. Bypassing part of the intestine also results in fewer calories being absorbed. This leads to weight loss. Laparoscopic surgery is performed using several small incisions, or ports, one of which conveys a surgical telescope connected to a video camera, and others permit access of specialized operating instruments. Our advice is to go for healthy diet, physical activity, and good sleep. Complications with all these surgeries are many and it is better to consult an experienced bariatric surgeon before deciding on the surgery.